Maybe you stayed offline all week and couldn't check out your favorite Gawker Media sites. Or maybe you just got back from an awkward brunch and want to escape for a bit. Well, whatever the case, we've got you covered. 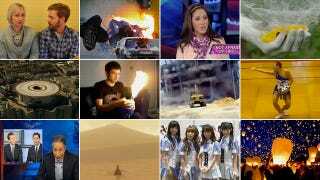 Here are some of the most amusing and entertaining videos we watched during the week that was. Two Lara Crofts. Both Pole Dancers. Is this video of a BMW drifting world's highest helipad a fake?